Health insurance is not cheap and it can be tempting to go without health insurance. With the expensive monthly cost and out-of-pocket costs, you may be wondering whether you really need health insurance. Many people in their twenties feel they are healthy enough to skip health insurance. When you are healthy and rarely see a doctor, it may seem like a good idea to cut out health insurance completely and to justify going without it. You can pay for things as you go instead of worrying about the insurance premiums and co-payments on the way. However, this is faulty reasoning. It is essential for everyone to always have some form of health insurance. medical debt, and seemingly no way out of the mess. One accident on the ski slope could cost you thousands of dollars in medical bills, and it can quickly climb higher if you need surgery or anytime in rehabilitation. Generally, that is a time when you will not be working either, and that means that you will lose money that way, as well. Emergency surgeries such as an appendectomy can be very expensive as well. Even with insurance, you may find it difficult to pay for health care costs in these instances. It is very hard to pay for medical costs without health insurance, especially if you are checked into a hospital even just overnight. The new changes under the Affordable Care Act do affect people in their twenties. If you do not have health insurance, you will face fines. There are health exchanges that you can use to sign up for health insurance or you can look at other options. Take the time to carefully review all of your options and choose a policy that will save you money and give you the protection that you need. Be sure to steer clear of things that sound too good to be true. Health shares may sound like health insurance, but they really are not. The health insurance landscape can be tricky to navigate. Here’s a start-to-finish guide to choosing the best plan for you and your family, whether it’s through the federal marketplace, private exchange or an employer. Most people get health insurance through an employer. If you’re one of them, you won’t need to use the government insurance exchanges or marketplaces. Essentially, your work is your marketplace. If your employer offers health insurance and you still wish to search for an alternative plan in the exchanges, you can. But plans in the marketplace are likely to cost a lot more. Most employers that provide insurance pay a portion of workers’ premiums, so they’ll likely offer the least expensive option. If your job doesn’t provide a health insurance benefit, shop on your state’s Affordable Care Act marketplace, if available, or the federal marketplace to find the lowest premiums. Start by going to HealthCare.gov and entering your ZIP code. You’ll be sent to your state’s exchange if your state is green on the map below. Otherwise, you’ll use the federal marketplace. You can also purchase health insurance through a private exchange or directly from an insurer. If you choose these options, you won’t be eligible for premium subsidies, which are income-based discounts on your monthly premiums. determine your out-of-pocket costs and which doctors you can see. provider directory, which lists the doctors and clinics that participate in the plan’s network, should also be available. If you’re going through an employer, ask your workplace benefits administrator for the summary of benefits. When comparing different plans, put your family’s medical needs under the microscope. Look at the amount and type of treatment you’ve received in the past. Although it’s impossible to predict every medical expense, being aware of trends can help you make an informed decision. If you choose a plan that requires referrals, such as an HMO or POS, you must see a primary care physician before scheduling a procedure or visiting with a specialist. Because of this requirement, many people prefer other plans. POS and HMO plans may be better if you don’t mind your primary doctor choosing specialists for you; one benefit of this system is that there’s less work on your end since your doctor’s staff coordinates visits and handles medical records. If you do choose a POS plan and go out of network, make sure to get the referral from your doctor ahead of time to reduce out-of-pocket costs. If you’d rather choose your doctors, you might be happier with a PPO or EPO. An EPO may also help you lower costs as long as you find providers in the network; this is more likely to be the case in a larger metro area. A PPO might be better if you live in a remote or rural area with limited access to doctors and care, as you may be forced to go out of network. Costs are lower when you go to an in-network doctor because insurance companies contract lower rates with in-network providers. When you go out of network, those doctors don’t have contracted rates, which costs your insurance company, and you, more. If you have preferred doctors and want to keep seeing them, make sure they’re in the provider directories for the plan you’re considering. You can also directly ask your doctors if they take a particular health plan. 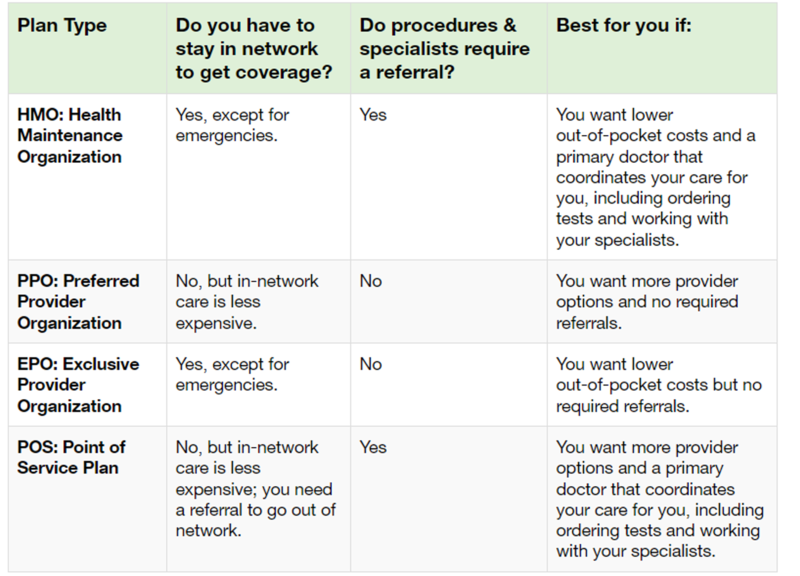 If you don’t have a preferred doctor, you’ll probably want a plan with a large network so you have more choices. A larger network is especially important if you live in a rural community, since you’ll be more likely to find a local doctor who takes your plan. Eliminate any plans that don’t have local in-network doctors and those with very few provider options compared with other plans. Nearly as important as network size is how costs are shared. Any plan’s summary of benefits should clearly lay out how much you’ll have to pay out of pocket for services. The federal marketplace website offers snapshots of these costs for comparison, as do many state marketplaces. This is where knowing some of the health insurance lingo is useful to know. As the consumer, your portion of costs consists of the deductible, copayments, and coinsurance. The total you spend out of pocket in a year is limited, and that maximum is also listed in your plan information. In general, the lower your premium, the higher your out-of-pocket costs. You can’t afford the higher monthly premiums for a plan with lower out-of-pocket costs. By now, you likely have your options narrowed down to just a few. To further filter the list, go back to that summary of benefits to see which plans cover a wider scope of services. Some may have better coverage for things like physical therapy or mental health care, while others might have better emergency coverage. If you skip this quick but important step, you could miss out on a plan that’s much better tailored to you and your family. Once you’re down to a couple of options, it’s time to address any lingering questions. In some cases, only speaking with a person will do, so call your broker. 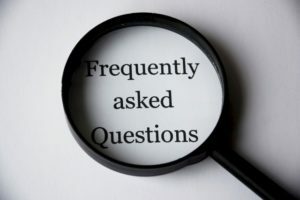 Write your questions down ahead of time, and have a pen or computer handy to record the answers. I take a certain medication. How is that covered under this plan? Which drugs for this disease are covered under this plan? What maternity services are covered? What happens if I get sick when traveling abroad? How do I get started signing up, and what documents will I need? Here’s a final tip: Don’t forget to discontinue your old plan before the new one starts if you switch. Go to your marketplace and view your plan options side by side. Or contact your local health insurance broker. Determine whether you want more health coverage and higher premiums, or lower premiums and higher-out-of-pocket costs. Make sure any plan you choose will pay for your regular and necessary care, like prescriptions and specialists.